Well, it is true. 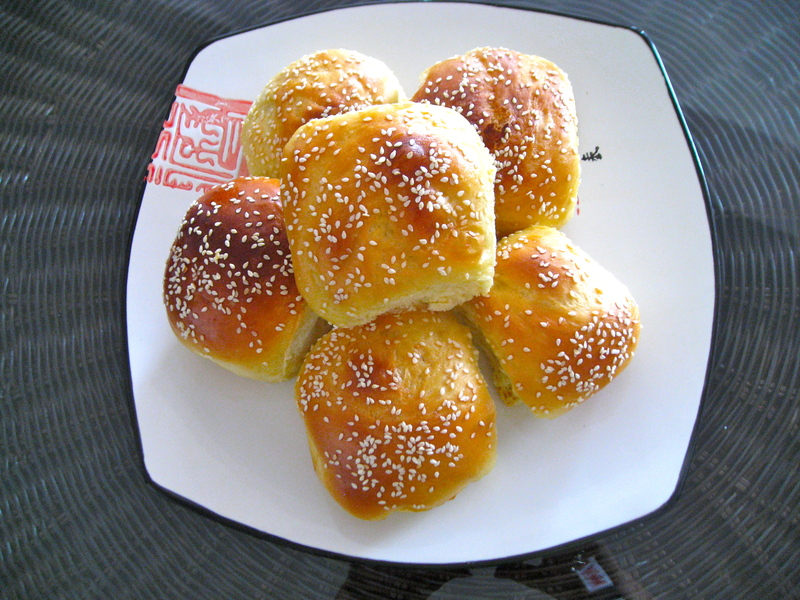 There is very little good, Western bread in China. Certainly not in Kunming anyways. Jenny Lou and Jenny Wong stores in Beijing have nice bread and Hisense Plaza Supermarket in the basement in Qingdao has good bread but that’s about it for what I know. Actually Bread Talk in Kunming and I hear the Wicker Basket also are okay but still too much sugar, not enough ‘bread taste’, more of a plasticy taste for me. Which brings to mind the old adage “If it tastes like it, and smells like it, then it must be ‘it’ ” I think there are too many chemical additives for the Chinese bread to be healthy. So where do you ask, have I found this GOOD bread…it’s in my kitchen. 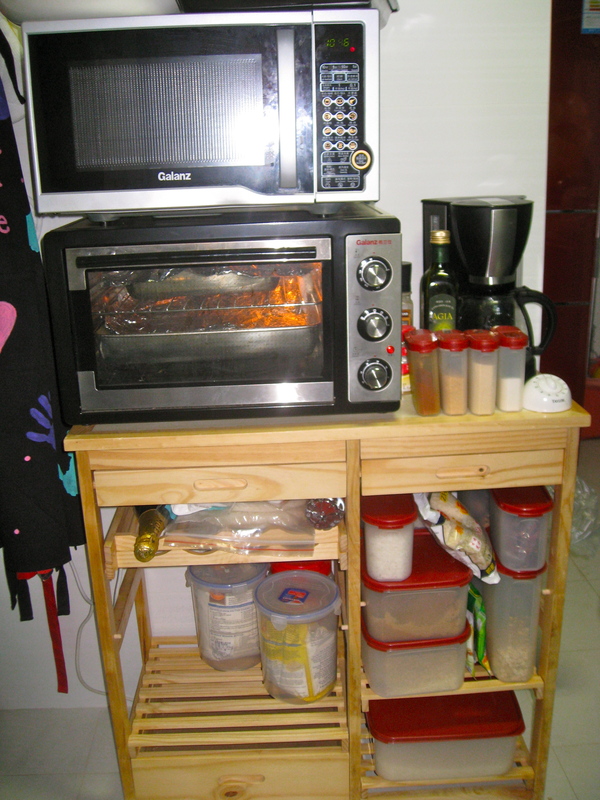 After at least a dozen batches, I have come up with the perfect recipe for my ‘kinda Easy Bake Oven’ (which is a small portable thing, not like a real oven) and for the altitude of Kunming, which is elevation: 1892 meters. 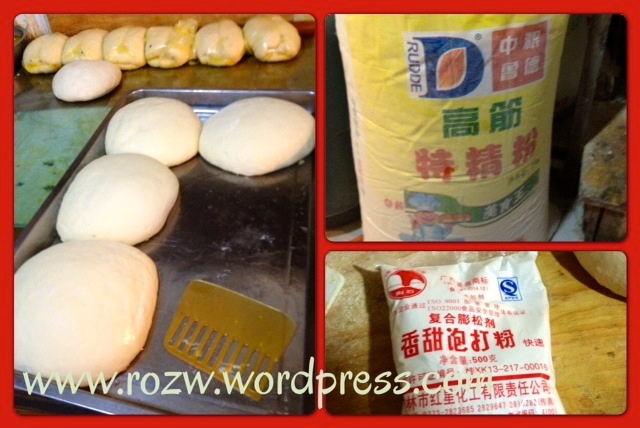 Place ingredients in the bread pan of your bread machine in the order given, and set to Dough setting. NOTE: My bread machine takes one and a half hours in the dough setting and the dough has had a first rise. If you are not using a bread machine, follow the same procedure, kneed the dough for 10 minutes and then place in a covered bowl in a warm place to rise for one hour. Then follow the remainder of the instructions. Turn off machine and turn dough onto a lightly floured cutting board. Divide the dough into four for 16 fist-sized pieces. I weighed my little pieces and each weighs 70 grams. Since I was bad in cutting into equal pieces I used a food scale and it helped! 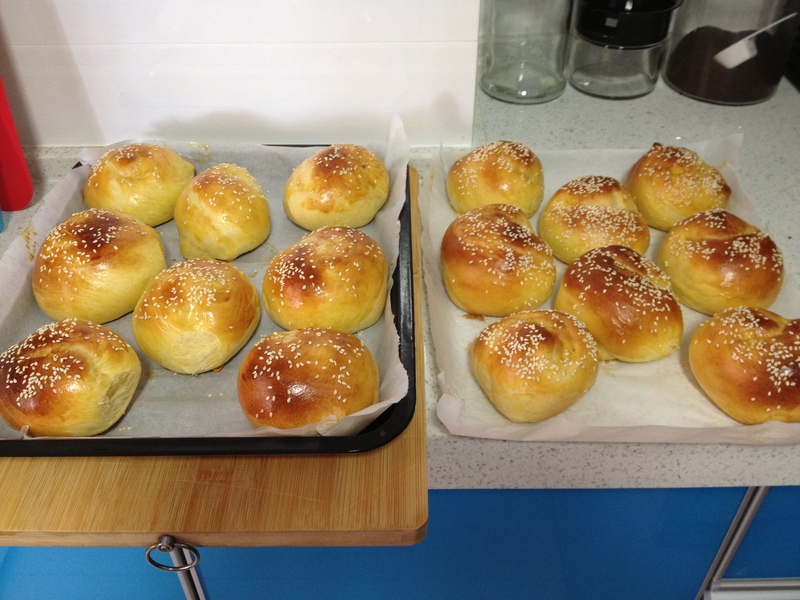 Make into buns by taking each piece and forming them into a bun shape or by rolling into a six-inch long rope. From the long rope, form a knot. 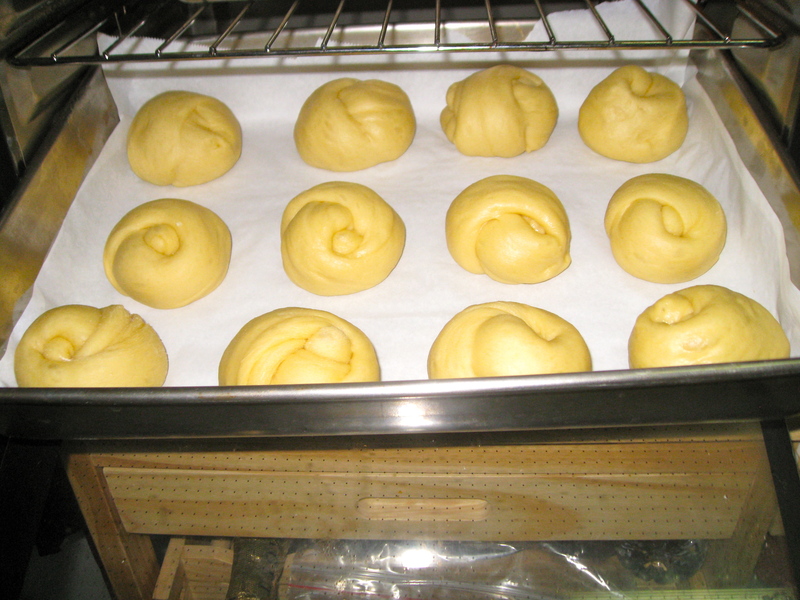 Then place each bun on a parchment-covered baking sheet. Cover and place in a warm place. Let rise for thirty minutes to one hour, or until almost doubled. 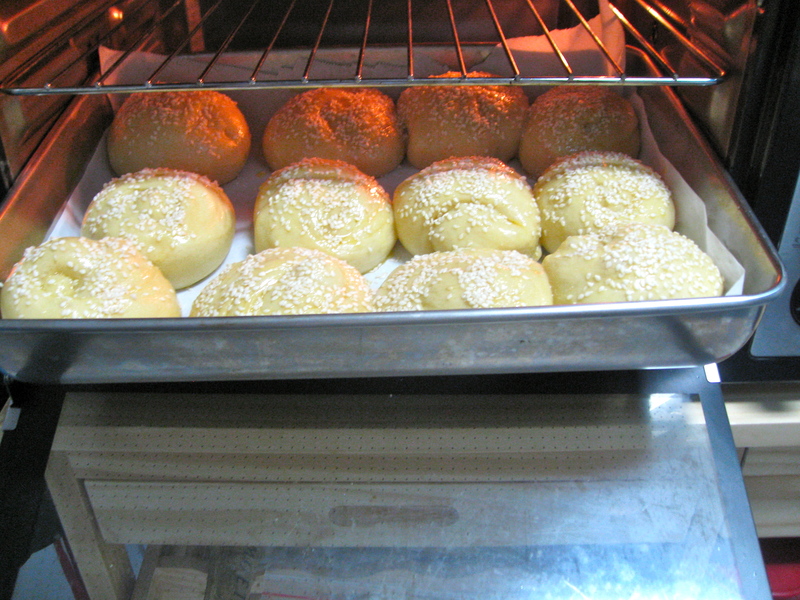 Preheat oven to 350 F. Brush buns with the one beaten egg. Sprinkle with poppy seeds or sesame seeds. Bake covered with foil for 25 minutes to avoid excessive browning. Then remove the foil and continue to bake for another 5-10 minutes or until golden brown. Now it’s time to have a sandwich. YUM!